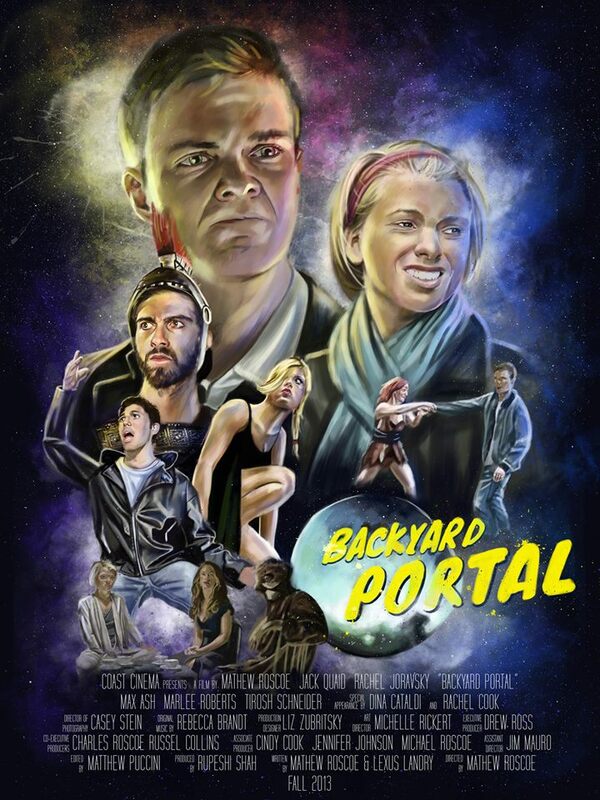 Backyard Portal, an upcoming short film by indie director Mathew Roscoe, is an interesting sort of fantasy/comedy about a couple that happens to stumble upon, oddly enough, a portal in their backyard that brings into their lives several characters out of various genres of film, and as you can imagine, much fun ensues. This project is notable for several things: NY composer Rebecca Brandt scored the film (We shall be speaking with her again soon), and among the cast is one of the actors from the box office smash The Hunger Games, Jack Quaid. Backyard Portal will be appearing at film festivals this fall. The director and cast had a few minutes to talk about the film. Mathew Roscoe (Director): In terms of the acting and skill, I have never been so stoked about a cast for a movie! I definitely pulled out all the stops. The entire cast are just exceptionally talented people! The cool thing that really gives the movie chemistry is that the cast is made up of mostly good friends that have previously worked with each other. 4 of the 5 actors all met at NYU’s Hammerkatz, where Donald Glover (Community) started out. Jack Quaid (David–He and Gina discover the portal): Backyard Portal was amazing to work on. I had an absolute blast working with my old friends and and an even bigger blast making new ones. The film was obviously different from something like The Hunger Games, but I loved working with a smaller budget and within one location because it allowed us to really play with these characters and find out what makes them tick: a luxury scarcely found on a giant set with a billion moving pieces. Rachel Joravsky (Gina, girlfriend of David’s): In general this was not a very difficult transition to make. I had been performing with Max, Jack, and Tirosh all year on NYU’s premiere sketch comedy group Hammerkatz. Needless to say we were use to collaborating and improvising together. Marlee was an excellent addition, we all vibed with her immediately — really just effortless to work with. Roscoe was really great at letting us do our thing, but also reining in the crazy. If it was up to us, we probably wouldn’t have stuck to the script at all. That’s what you get when you have 4 plus improvisors together. Everyone is going to be vying for the last joke. Tirosh Schneider (Chance, a version of a greaser): I modeled my performance on a purposefully bad impression of both Danny Zuko and Elvis Presley, but more than anything I was inspired by the director, Matthew Roscoe, who had a very clear vision for Chance (the voice and all) from the very beginning. He was great in communicating the part to me down to the voice, so it came pretty easily after that. Marlee Roberts (Dorothy, a version of the action heroine): I’m very grateful I was given the opportunity to play “Dorothy” in Backyard Portal. Most roles I’ve played are of the innocent good-girl (“Spaz”) or cheerleader-esque stereoype (“The English Teacher”) so it was fun to wear black leather, beat up toasters, and explore this side of myself. Director Mathew Roscoe and I discussed our inspiration for the role including character references from The Terminator and Firefly. We applied some of these characteristics while discovering Dorothy’s originality and intentions by building a back-story. Dorothy is very complex in the way that she has an almost childlike dependency while maintaining a cold exterior. To build her as a three-dimensional character, it was really important for me to understand why she doesn’t trust anyone. Why is she deathly afraid of machines? And what about them invokes such a strong emotional response from her? I wanted to humanize the “action-girl” by creating a reason as to why she behaves the way she does. Every decision is motivated. Without a doubt, it’s one of my favorite roles I’ve ever played. Max Ash (Marcus, a loud Roman warrior): This was actually the first short film I was ever in so I guess it was different than portraying my regular life as I’m not aggressive or a Roman warrior. While I watched clips of Spartacus and Gladiator on YouTube to get ready for the role, my characterization was based mostly off what I remember about the movie 300. I haven’t seen it since it was in theaters but I remember a lot of yelling and angry looks so I did a bunch of that. This entry was posted in Film, Indie, Interview and tagged Backyard Portal, indie film. Bookmark the permalink.